In the dynamic business environment of today, Information Technology (IT) organizations face challenges around scalability and performance. This IBM® Redbooks® publication is targeted for IT architects, IT personnel, and developers who are looking to integrate caching technologies, specifically elastic caching, into their business environment to enhance scalability and performance. Although it is helpful to know caching technologies, an introduction to caching technologies in general is included. In addition, technical details are provided about implementing caching by using several IBM products. The IBM WebSphere® eXtreme Scale product provides several functions to enhance application performance and scalability. It provides distributed object caching functionality, which is essential for elastic scalability and next-generation cloud environments. It helps applications process massive volumes of transactions with extreme efficiency and linear scalability. By using the scalable in-memory data grid, enterprises can benefit from a powerful, high-performance elastic cache. The IBM WebSphere DataPower® XC10 Appliance enables your business-critical applications to scale cost effectively with consistent performance by using elastic caching in a purpose-built, easy-to-use appliance. 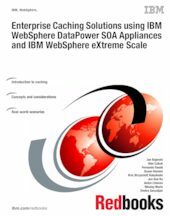 This publication explains the benefits of using various caching techniques in your enterprise, specifically involving the use of IBM WebSphere eXtreme Scale and the IBM WebSphere DataPower XC10 Appliance. Three real-world scenarios are described that use these enterprise caching technologies to solve issues that face the businesses of today.